Advertisement firms are one of the most sought after companies by any kind of business for extensive promotions. And yes, these advertising agencies themselves need a smart marketing tool to promote their business and reach the right client. Over 98% of the people who utilize the internet have access to emails, which means that email marketing can prove to be the best edge for promotions. With emails -> Reach the client’s inbox -> Get an undisturbed environment for interaction with the customer -> Hike in client conversion rate. With a proper email marketing tool -> Manage a huge database & send e-templates & newsletters in bulk -> Analyze the metrics & track reports with Google Analytics. 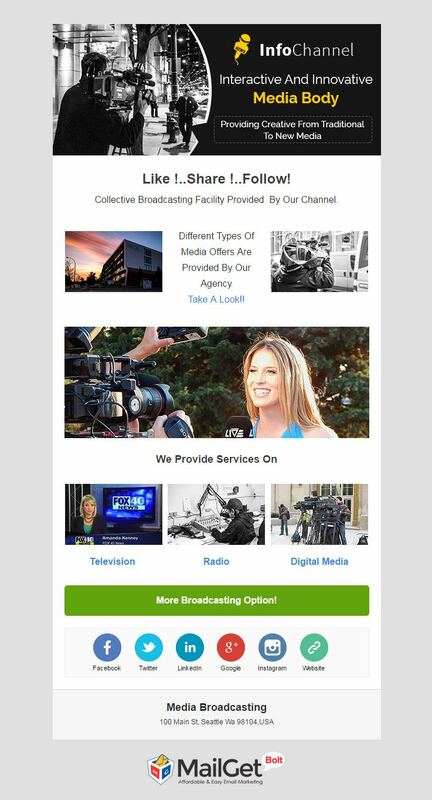 Medica companies, whether indoors or outdoors, offline or online can use this top-class & responsive email marketing service to inform their existing & potential clientele about their advertising facilities. With the user-friendly drag & drop email builder, compose templates by adding pictures, text, social icons, links & move/rearrange them as per your need. Select the contact lists to which you want to send the emails & dispatch hundreds of emails in just a few clicks. Email signup forms can be embedded easily to effortlessly grow the list of subscribers. Segment the clients according to their business advertisement requirements and send them specific emails. Automated emails like drips & autoresponder are the perfect way to nurture the leads right from the first day. Preview the emails before it hits the client’s inbox & rectify all the errors before it damages your brand. 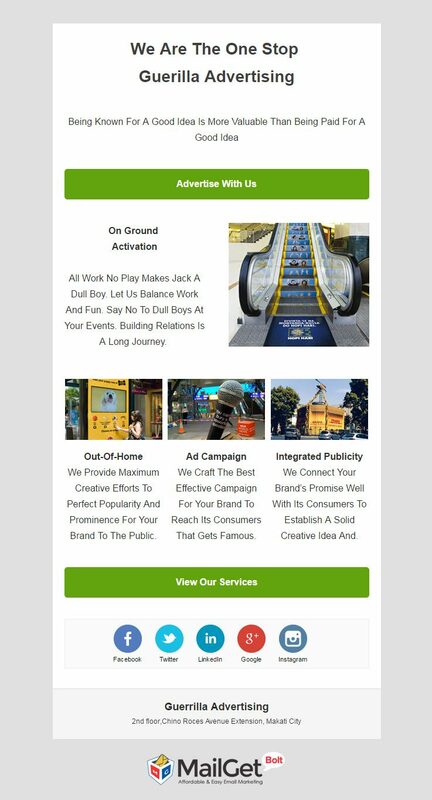 Branding agencies need a well-integrated promotional tool like this email marketing service using which they can create templates featuring pictures of their advertising facilities & discount offers. Send these emails to any number of contacts & regularly track them. This software has a promising 99% email inbox delivery rate, thus helps to build a recognizable brand of your advertising company among the clients. All the email templates get optimized according to the device used by the recipient. Add powerful links & buttons in the email templates, so that the clients are much convinced to click on the link. Create as many lists of contacts as you want and supervise them with the efficient list management feature of the software. Email marketing can prove to be very effective for flyer advertising firms as they can plan the whole email sending strategies as per their business needs. Email template designing, sending bulk emails, evaluating the email tracking reports & much more can be easily done with this tool. Embed signup forms on your website to collect leads & put them into different groups on the basis of their advertising requirements using the list segmentation facility. Build a fruitful connection with the subscribers right from the moment of their subscription via autoresponder & drip emails. The dashboard provides all the information about spam, bounced and unsubscribed email addresses. You can schedule the emails to be sent at a later point in time when they are most likely to engage the client. 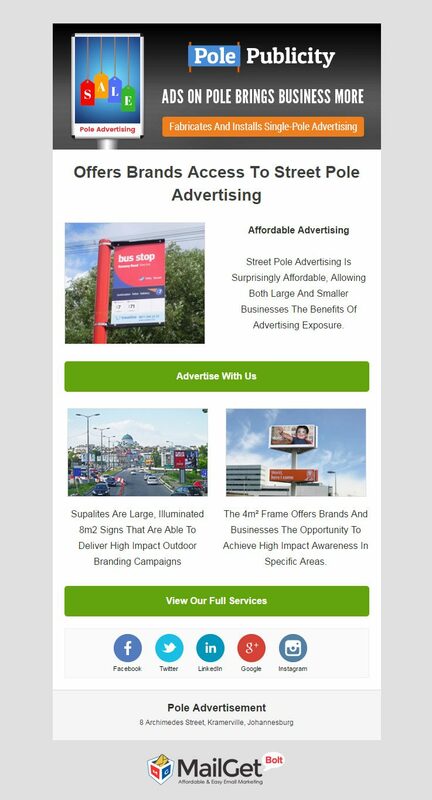 Pole advertisers & all alike outdoor media companies can use this email marketing software to start extensive promotion of their business. The various features of this tool will allow you to make an instant impact on the new, existing & potential clients via emails. Plan the emails to be sent at the same time while they are created or pre-schedule them to be sent on another date & time using a drip campaign. This tool has a number of email builders like drag & drop, custom code, and basic text editor. Preview the emails before you send it to the contacts and rectify the errors before it has a bad impact. Greet the users by sending them automated welcome & other special offer emails. To hike up the email opening rates, send the emails with names of the contact without being bothered of individual email personalization. Emails are the most effective way to connect with clients & prospects, as you get to reach right into their personal communication environment. This email marketing software is specially crafted for billboards & hoarding advertisers. 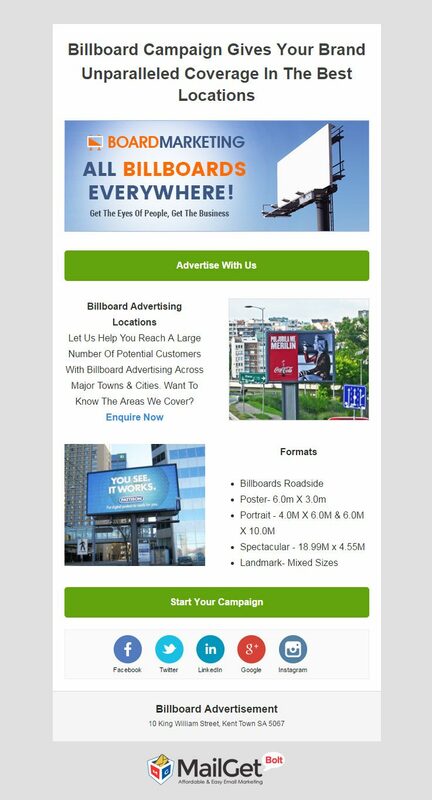 Design the layout of the email template according to the billboard promotion needs, send these emails instantly with just a few clicks. You can also schedule the emails to be sent later when you are about to launch any new service. Dispatch automated emails to clients to serve their queries & actions all round the clock. This email marketing software all by its own send auto-follow-up emails to those contacts who have not opened the emails for the first time. This tool has a high email inbox delivery assurance, thereby building up a strong brand image in the minds of clients. 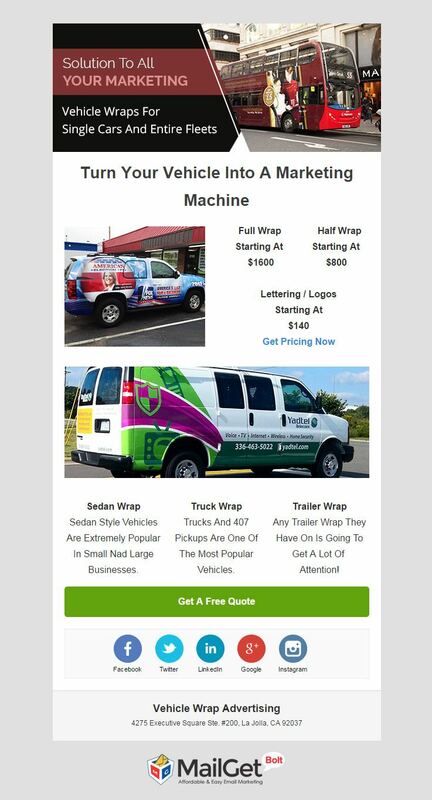 Grab the attention of all potential customers towards your street advertising company via informative email templates. This software allows composing attractive emails by adding images, text, social media icons, buttons & send them to millions of contacts. Email marketing personalization in bulk & inbox preview option are the exclusive features of this software that increases the email opening & conversion rate. Compose your own customized email templates by using the custom code editor. Embed email subscription forms on your as well as on other high profile websites to effortlessly grow the subscribers’ list. Manage & maintain clean multiple contact list as this tool provides complete information about spam, bounced & unsubscribed email Ids. Automobile wrap advertisements are the most attractive form of promotion for any company and so it is the aptest time to expand your advertising agency. Using this email marketing service will take this to plan to a faster track & give quick results. Collect hundreds of contacts via sign-up forms, manage them easily, build emails & send the emails in bulk with this tool. The dashboard is very interactive, easy to work with & gives the details of email opening, clicking & unopened email rates. Using the email tracking extension, evaluate what kind of message works best for engaging the client. Choose the way you want to send the emails regularly or calendar them to be delivered automatically at pre-scheduled date & time. Easily arrange the contacts according to their business preferences & send them targeted emails to get maximum response. 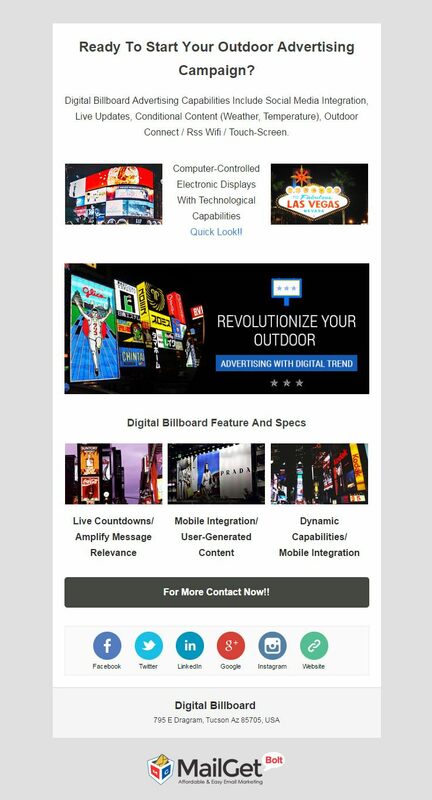 Electronic display & digital billboard companies who are planning to expand their customer base must go for this result-oriented email marketing service. 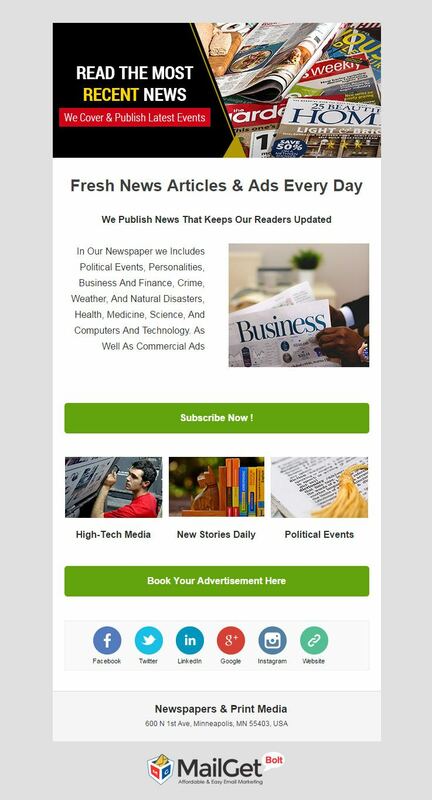 Use the editable email templates to design newsletters as per your needs. Send them to hundreds of clients & customers after selecting a particular list to which you wish to send the emails. To provide an easy way to the clients who wish to opt out from the emailing service, provide an unsubscribe handle in the email template. All the email templates sent for the promotion of digital billboards are completely responsive in nature. To inform the clients about any specific electronic display boards feature, you can simply send text emails as well with the basic text editor. Get the real results, the status of sent emails from the dashboard & constantly improve the promotional campaigns. 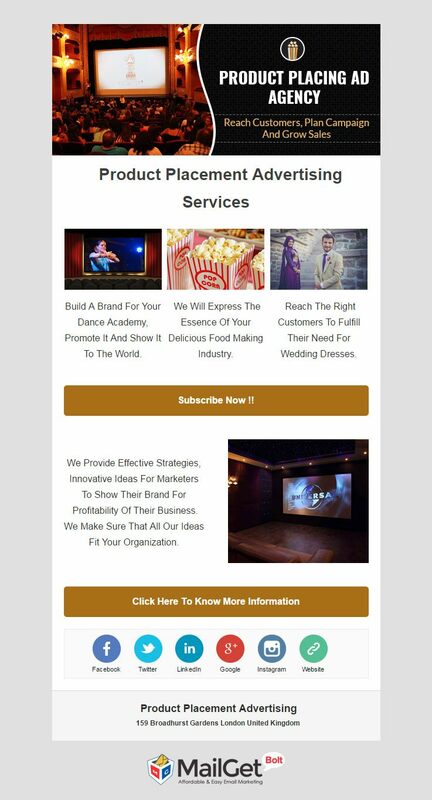 Neon sign & light board advertising companies can use this easy to use email marketing software to promote their services among a wider orbit of businesses. 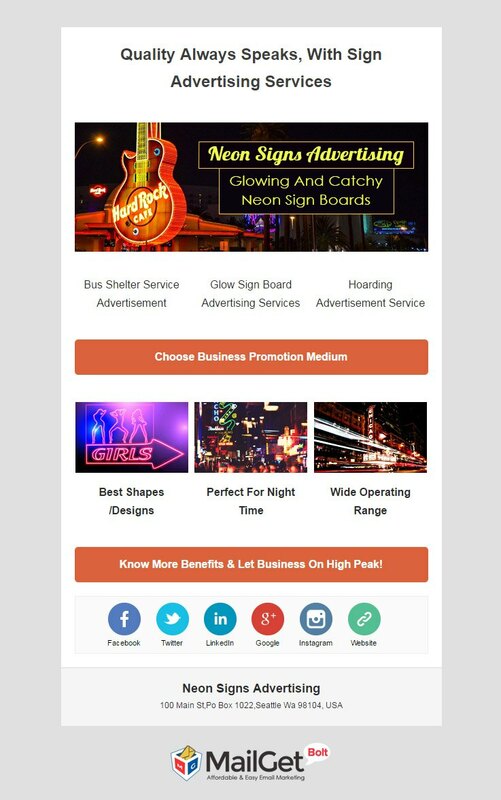 Send them attractive email templates featuring the neon boards & compel them to try the products via catchy links & buttons. You can track these bulk emails with the integrated Google Analytics functionality & continuously upgrade the emailing style according to what works best for engaging the clients. Organize thousands of contacts & send specific emails to a particular bunch of people to suit their business needs. Separate contact tab to create as many lists of subscribers, registered users, clients as you need. With the drip & autoresponder emailing feature, you can start sending automated emails. Email marketing for web advertisers will take their business to another level as they will be able to connect with more clients & prospects through their emails. This is a major tool of online promotions as one can plan everything from email template building to sending bulk emails. The dashboard of the software is very interactive and provides details like email opening & clicking rates, subscribed, spammed & bounced email ids. Import the contacts manually or simply upload a CSV file to build up the contacts list. Send text only emails regarding any new online promotional deals & offers with the basic text editor. The exclusive auto-follow-up feature can be used to automatically send emails to those contacts who have not opened the emails for the first time. Grow the sales of your mobile phones & other cellular devices by doing extensive promotions using this email marketing software. 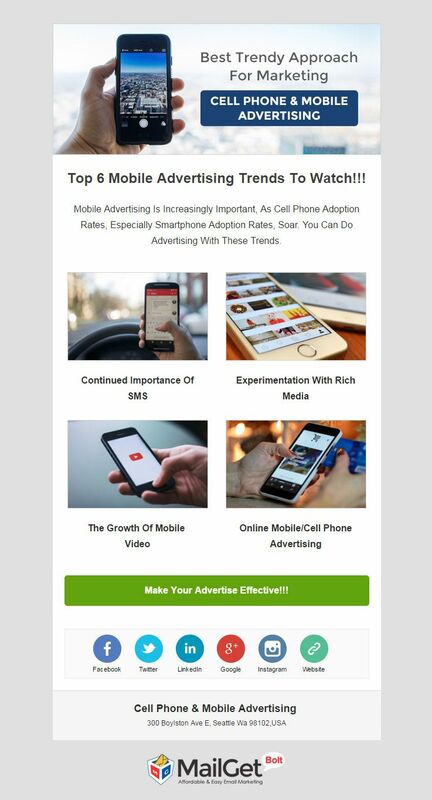 Create email templates featuring the mobile brands, deals & discounts on the cell phones and send them to multiple contacts. You can choose the email campaigns on the basis of your business requirements like regular or drips. Build up a consistent communication with the clients using autoresponder emails. With the drag & drop builder, design the layout of the template to best suit the mobile specialties. Greet the recipients by sending emails with personal names & hike up the email opening rates. Apart from adding pictures, text, links in the email templates, add an unsubscribe handle to provide an easy way to the contacts to opt out of the email service. Reach out all the big & small corporate firms through this bulk email marketing software and promote your guerilla advertising agency. Build up multiple contact lists, segment the contacts according to their advertising needs & send them targeted emails. Pre-schedule a series of emails using the drip campaign & the emails will automatically get delivered to the contact’s inbox on the set date & time. 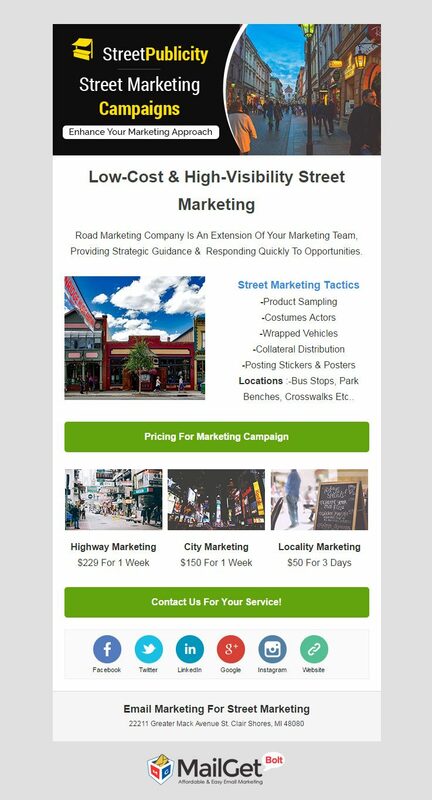 Explain guerilla advertising strategies to the clients by composing illustrative email templates with the handy builder tool. Schedule the emails to be sent later at a point in time when it is most likely to engage with the client. The email templates sent with this software gets customized to the screen size & device. 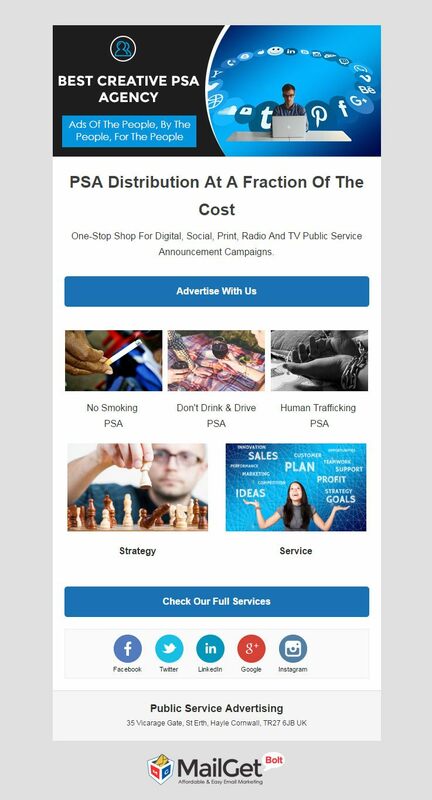 Help social service organizations reach your public service advertising company easily straight through their emails. Send them instructional multimedia email templates or simple text emails in bulk quantity with this sleek software. Implant email subscription forms on your as well as other high-profile websites to fetch leads from different parts of the business market. Maintain a clean contact list as this software provides details of spam, bounced & unsubscribed users. Use the email tracking analytics to evaluate the performance of the previous email campaigns. Scan the email templates before it hits the client’s inbox with the email inbox preview option. Strengthen your product advertising company amidst other parallel businesses with this email marketing software, that allows sending bulk emails concerned with product placement advertising features. Increase engagement with existing & potential client base by sending them automatic follow-up emails, if they miss the emails in the previous campaign. Increase brand awareness with this software as it promises a high email inbox delivery rate. This email marketing tool provides a fully-functional & easy to work dashboard. The email tracking reports & metrics are displayed right on the dashboard’s front page. 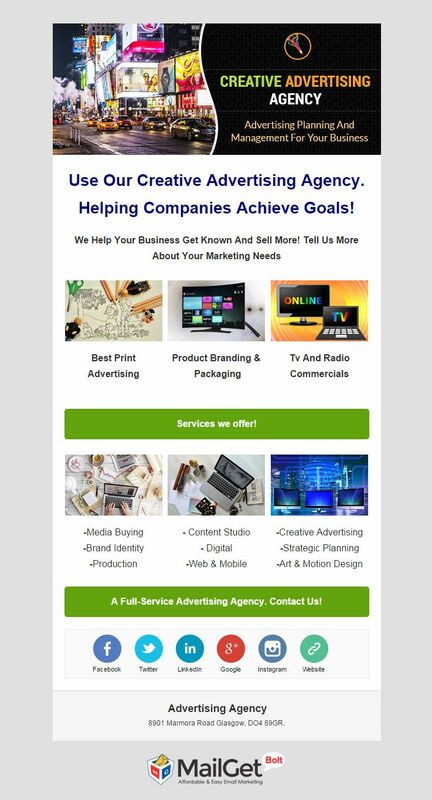 Utilize this dynamic email marketing service to promote your commercial advertisement writing skills among all the business owners. 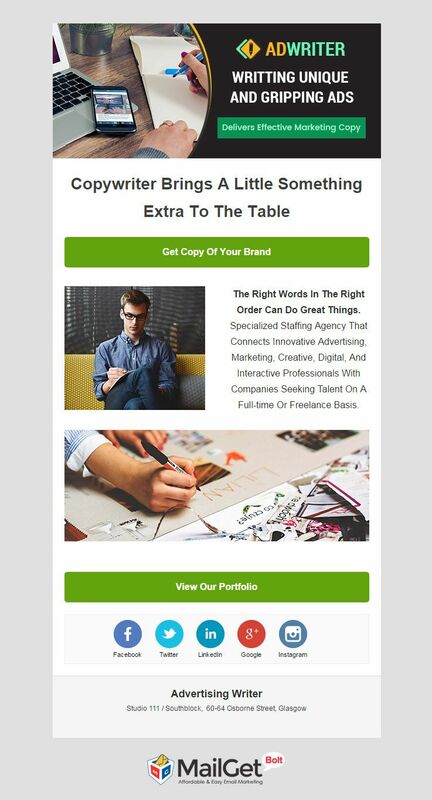 Reach straight into their contact email inbox & inform them about your writeups via captivating email templates. This software gives the list of email addresses who have not opened the emails in the first go & you can resend the same emails to them with a different subject line. Grow the list of subscribers without much difficulty by embedding email signup forms on other high-traffic networks. Send a series of emails at different time intervals using a drip emailing campaign. This software provides a number of email builder tools like drag & drop builder, custom code & basic text editor. 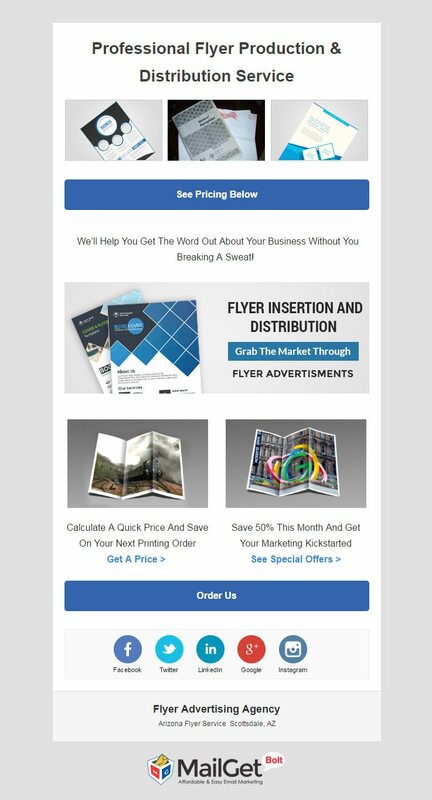 Send bulk promotional emails regarding your print media company to thousands of contacts & constantly track them with this flexible yet result-oriented email marketing software. 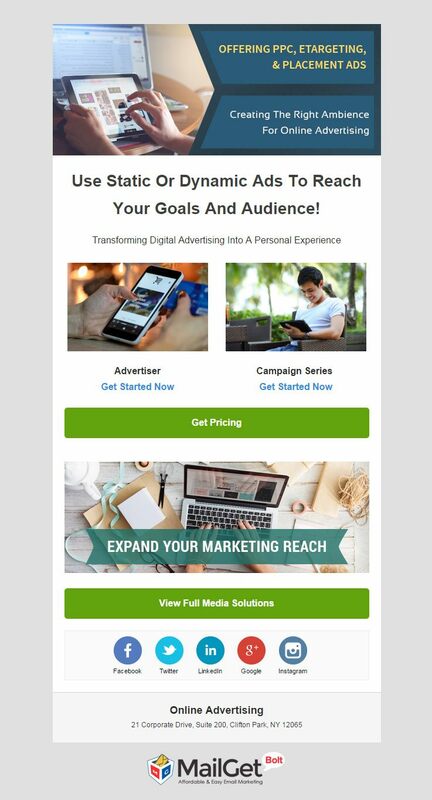 With this affordable email marketing tool create subscribers list, expand them continuously, segment them on the basis of their print advertising demands, so that it becomes easy to deliver targeted emails. Link the email sign-up forms on your website with the autoresponder feature, so that a new user immediately gets welcome emails on signing up. Send emails with personalized tags & preview the email templates before you send them to the contacts. Manage millions of contacts easily with the inbuilt features & nurture them specific emails. Email marketing has emerged as a cheap & result-oriented promotional channel for any sort of business, may it be the advertising companies. Hope this list post has helped you in finding a valuable solution that results in the expansion of your business. All the above-mentioned software are based on MailGet Bolt, which is a customizable tool & can be used to plan the email marketing campaigns from scratch. You just have to login here, and begin the whole process.